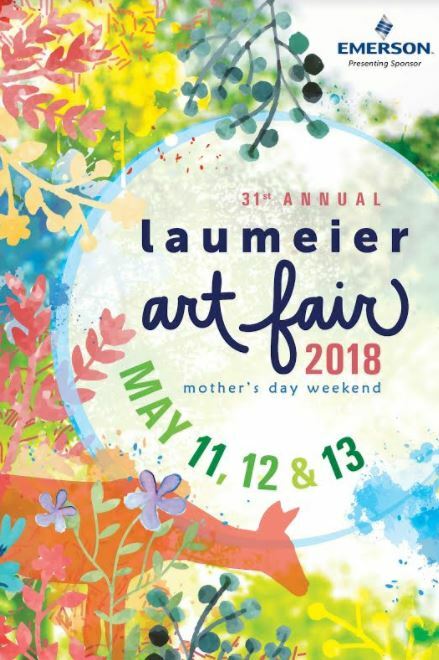 Laumeier Sculpture Park hosts the 31st Annual Art Fair, presented by Emerson, May 11–13, 2018. More than 15,000 patrons attend this annual three-day event on Mother’s Day weekend, featuring local food and beverage vendors, hands-on activities for kids, live music and up to 150 juried artists from across the country exhibiting work in ten media categories: ceramics, fiber/textiles, glass, jewelry, mixed media, painting, photography/digital, printmaking/drawing, sculpture and wood. The Annual Art Fair is produced in partnership with St. Louis County Parks; event proceeds support the nonprofit’s mission of engaging the community through art and nature. Highlights of the weekend include the City of Sunset Hills Music Festival, free with event admission on Saturday, May 12, and the Edward Jones Creation Location, free with event admission on Saturday and Sunday, offering activities and entertainment for kids and families. Main stage entertainment includes Sean Canan’s Voodoo Players, Grace Basement, Dave Black, The Big Rigs, The Kasimu-tet, Naked Rock Fight and Trixie Delight, among others. Concessions vendors include 4 Hands Brewing Co., Beer Outside, Blues Fired Pizza, Capitalist Pig BBQ, Essentially Fries, Mission Taco Joint, Narwhal’s Crafted Urban Ice and Schlafly Beer, among others. Friday, May 11, 6:00–10:00 p.m.
Saturday, May 12, 10:00 a.m.–8:00 p.m.
Sunday, May 13, 10:00 a.m.–5:00 p.m. Admission can be purchased on site or in advance at www.laumeier.org/shop. No physical tickets. Visit the Things to Do Page for more fun activities.